A history of how the Greater Orlando Chamber of Commerce petitioned the federal government to construct the new Downtown Orlando Post Office and federal court building in Downtown Orlando, Florida, in 1935. After a request was filed by U.S. Representative, J. Mark Wilcox (1890-1956) Orlando was placed of an eligibility list by Congress in 1936. 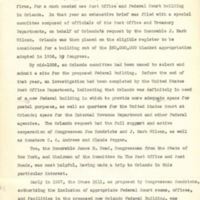 By mid-1936, it was determined that Orlando was in need of the new federal buildings. Efforts to that end were supported by Rep. Joe Hendricks (1903-1974) and U.S. Senators Charles O. Andrews (1877-1946) and Claude Pepper (1900-1989). 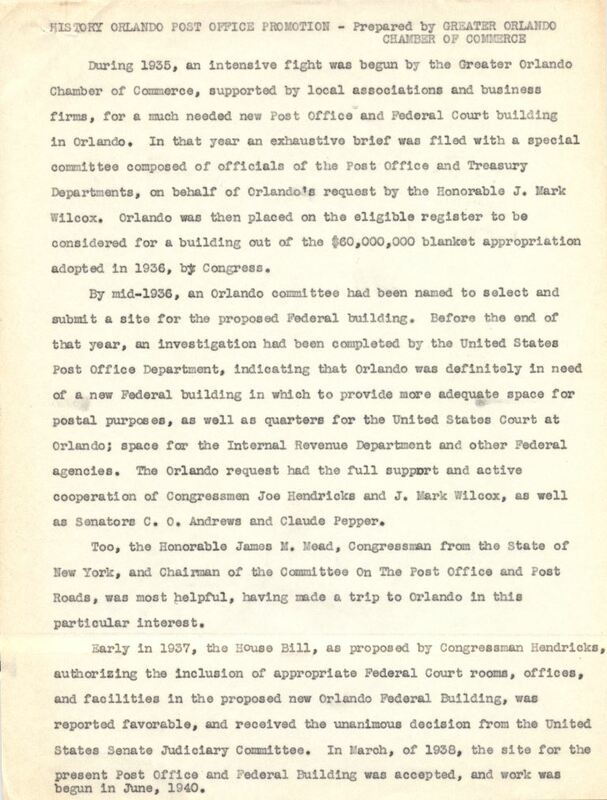 A House bill for the Downtown Orlando Post Office was supported and taken up by the Chairman of the Committee of the Post Office, Senator James M. Mead (1885-1964), in 1937. The bill passed and a construction site was chosen in 1938. and construction itself began in 1940. Original document by Greater Orlando Chamber of Commerce: Private Collection of Texann Ivy Buck. "Letter from J. D. Beggs to Charles O. Andrews (April 9, 1941)." RICHES of Central Florida. https://richesmi.cah.ucf.edu/omeka/items/show/7613. Originally created by the Greater Orlando Chamber of Commerce. Greater Orlando Chamber of Commerce. “History of Orlando Post Office Promotion.” RICHES of Central Florida accessed April 20, 2019, https://richesmi.cah.ucf.edu/omeka/items/show/7609.